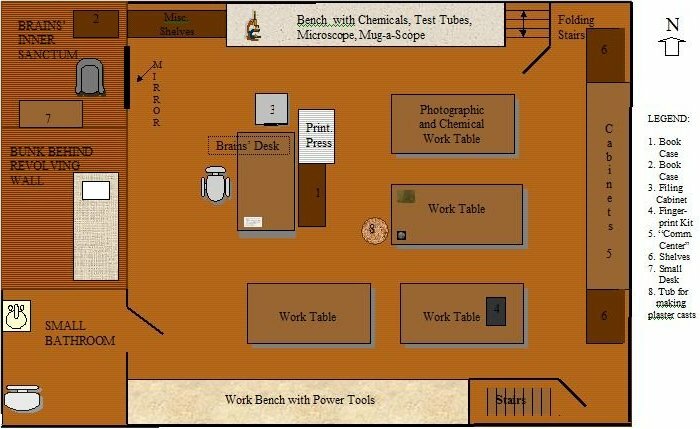 Many moons ago someone (not me) took the time to draw up a floor plan of The Lab based upon the stories and uploaded it to the files section of the Brains Benton Group on Yahoo. About 3 months ago I started using an open source 3D computer graphics program called Blender and after watching many tutorials on YouTube decided that I needed a project. But what should I do? Then I remembered that Lab floor plan and I knew what the project would be, a Lab floor plan in 3D. The floor plan of the Lab consisted of four rooms. Brains Inner Sanctum, Jimmy mentions it in RR, The Bunk room that Skeets used in MM, a small bathroom ( what lab would be complete without one:) ), and the main Lab.